Recreational boat sales growth slowed in June, but single-digit gains in the main powerboat segments and industrywide were enough to keep both categories ahead by double digits for the first half of 2012. Groupings that have carried the industry for months continued to do so. Sales of aluminum pontoon boats rose 15.7 percent, to 3,545, from the same month a year earlier, and sales of aluminum fishing boats gained 7.7 percent, to 2,281, according to figures compiled by Aarn Rosen, national sales manager at Statistical Surveys Inc. Sales in the main segments, which consist of the two aluminum boat groups and five groups of fiberglass boats that range from 11 to 99 feet, rose 6.1 percent from June 2011 to 10,838 boats. Industrywide, sales rose 5.3 percent for the month to 19,400 units. The data for June are based on information from 25 early reporting states that comprise about 58 percent of the U.S. boat market. June sales represent 15.5 to 16.5 percent of the year’s retail activity. Reports of sales of documented vessels were complete only through May 22 because of data entry delays at the Coast Guard, Rosen says, which means sales totals for boats 30 feet and larger are significantly understated. For the year to date, main segment sales were up 15.5 percent, to 64,377 boats, and industrywide sales have risen 14 percent to 101,498. Through June, sales of aluminum pontoon boats were up 29.9 percent, to 16,782 boats, and sales of aluminum fishing boats were up 13.9 percent to 19,782 boats. 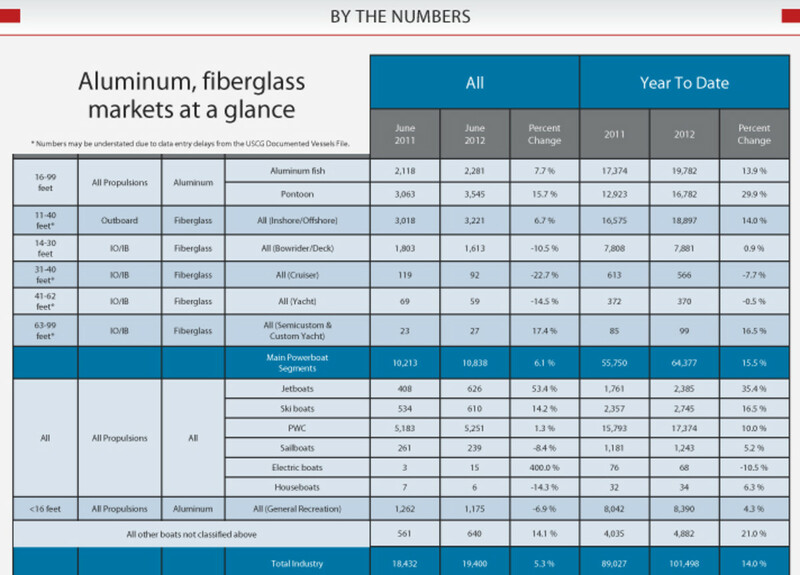 Among the fiberglass categories, sales in the high-volume 11- to 40-foot segment rose 6.7 percent in June to 3,221, Through June, they were up 14 percent to 18,897. The core 14- to 30-foot segment was a disappointment, as sales dropped 10.5 percent, to 1,613, in June, but the category remained a slight 0.9 percent ahead for the year, at 7,881 boats. Sales of 31- to 40-foot cruisers and 41- to 62-foot yachts fell during the month, but there were 27 sales reported in the 63- to 99-foot yacht category, four more than in June a year earlier. Jetboat sales roared ahead by 53.4 percent to 626, and ski boat sales increased by 14.2 percent to 610, but sales of PWC were only 1.3 percent higher at 5,251 units. For the year, jetboat sales were 35.4 percent higher, at 2,385, ski boat sales were 16.5 percent higher, at 2,745, and sales of PWC were 10 percent higher at 17,374. Sailboat sales fell 8.4 percent to 239, but they remained 5.2 percent higher for the year at 1,243.